Regardless of whether you’re old or young, female or male, or the degree to which you require assistance, the Jaco™ robotic arm is adaptable to your situation and your environment. Jaco™ Users will achieve a newfound sense of autonomy and an improved quality of life. The robotic arm can help maximize your abilities and decrease your reliance on family members and care providers, letting you function at a higher level both at home and in society. 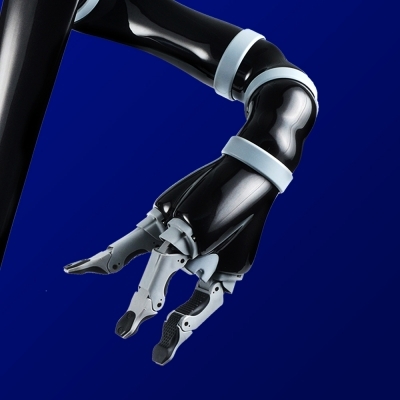 According to a 2011 study, the purchase price of a robotic arm is generally amortized in less than three years. KINOVA JACO™ Assistive robot offers individuals a fundamental and life-changing improvement by helping users achieve many objectives as defined by the International Classification of Functioning, Disability and Health and much more. These activities of daily living will feel easier and a greater sense of purpose will be established. It’s a wonderful feeling knowing that new things are suddenly possible and tackling new challenges. Easy to integrate: Can be mounted on almost any power wheelchair. Easy to use: Can be controlled using the chair’s joystick, head control, sip-and-puff/head array systems or almost any other interface, in any combination. Compact and low profile: Mounted on a wheelchair to minimize overall width, allowing all seat movements to ensure clearance for transfer and other equipment, as well as maximizing the arm’s reach to access even the floor. Energy efficient: Uses the power wheelchair battery to power the arm. Light and strong: Made of lightweight carbon fiber. Versatile and smooth: Features a six-axis movement, corresponding to shoulder, elbow and wrist, allowing 16 movements in all to mimic a human arm and hand. Check out our blog post on the Jaco™ Assistive Robot or call us today to learn more!